Phoenix-based manufacturer of nontoxic, biodegradable products, For The Earth Corporation, has revealed they completed the acquisition of Prestige Pet Products, Inc. The terms of the deal have not been disclosed. Prestige Pet will operate in the capacity of For The Earth subsidiary and add to its offerings including Dream o’ Bowls pet feeders, PaPurr cat litter, Litter To Go, What Odor? spray and What Stain? spray. For the Earth agreed last year to acquire Miller’s Cats and Kat Box King. For the Earth Corporation sells 100 percent green products that range from odor elimination to eco-friendly stain remover. They plan to launch a line of all-natural cleaning products and healthcare products. One of the patented processes of Prestige Pet includes their smoking process, including pork hide chews they tout with a higher palpability than other chews on the market. Prestige Pet Products have been importing pet supplies for the last 20 years and servicing mass merchandisers, pet supply distributors, and grocery accounts on either direct import or distribution center programs. Over the past 5 years, the company reports actively pursuing private label programs. 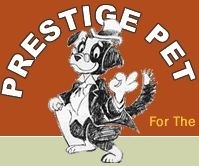 For more about Prestige Pet, visit http://www.prestigepet.com. The official website of For the Earth Corporation is http://www.fortheearthcorp.com/.